Canadian indie-folk singer-songwriter LeRiche unveils his dazzling new single ‘Under Covers’, set for release on 12th May via beloved and influential Fierce Panda Records. Following up on last year’s ‘Quiet Steady’ EP, which encapsulated a gentle soul with a singular talent while aptly illustrating his intimate playing style and passion for cinematic songwriting and velvety melodies - the new single is the demonstration of his serious songcraft, where the hazy sounds of and elegiac moments of his debut get streamlined into something more form-fitting. Hailing from Port aux Basques, a scenic town with a population of less than 5,000 people in Newfoundland, LeRiche’s passion for music stemmed from an early age, stretching his fingers out on a six-string at the eye-opening age of one, and later learning his craft in the darkened bars at the far end of Canada. If all this might suggest a profoundly solitary troubadour with an acoustic guitar, the reality couldn’t be far, as LeRiche’s musical journey includes a diploma from the College of the North Atlantic in Music Industry and Performance, which exposed him to all aspects of the music industry. ‘Under Covers’ is a complex, fluid understatement of intent, with influences spanning from Fleet Foxes’ rolling melodies to Local Natives emotionally cathartic choruses. A first look at his upcoming EP, due for release on Fierce Panda Records later this year and which consists of seven breezily heartfelt cuts that exemplify LeRiche’s heartwarming approach to music: one that is sure to resonate with listeners on its release. 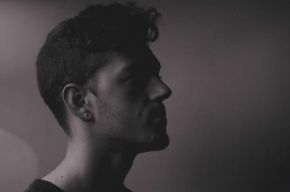 With upcoming live shows including a London show at The Finsbury on 18th May and a slot at The Great Escape Festival in Brighton at The Black Lion on 19th May, LeRiche will cement his status as a bonafide songwriting talent.